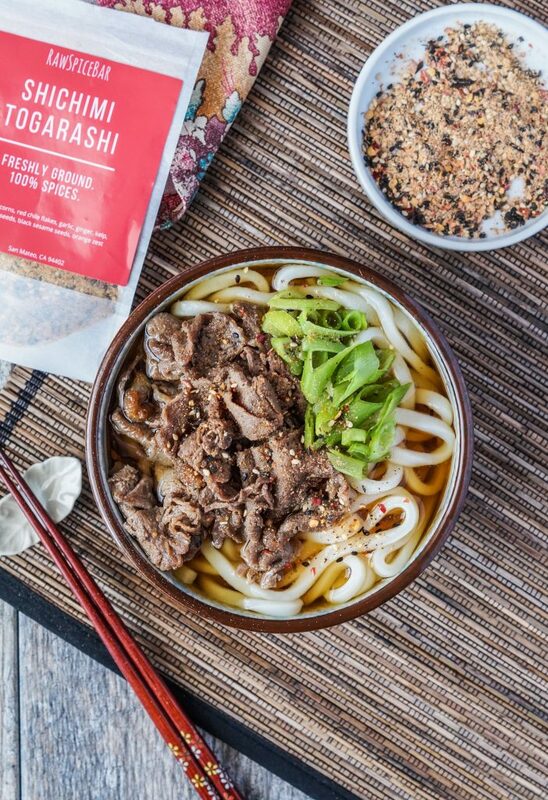 Stay warm this winter with Niku Udon (肉うどん): a Japanese noodle soup with a seasoned dashi base, thick udon noodles, thinly sliced and marinated beef, negi/scallions, and a sprinkling of Shichimi Togarashi. I originally published this recipe for Niku Udon from the cookbook, Japanese Soul Cooking: Ramen, Tonkatsu, Tempura, and More from the Streets and Kitchens of Tokyo and Beyond, a few years ago, but recently made it again with updated photos. Udon noodles are a favorite of mine and this soup is such a wonderful way to enjoy them in the winter. The seasoned dashi broth is the base for the udon noodles and marinated shaved meat- usually beef. There are a few specific ingredients needed to make this soup, but the amazing flavor is completely worth it. The soup base can even be prepared up to 5 days in advance and refrigerated until ready to serve. 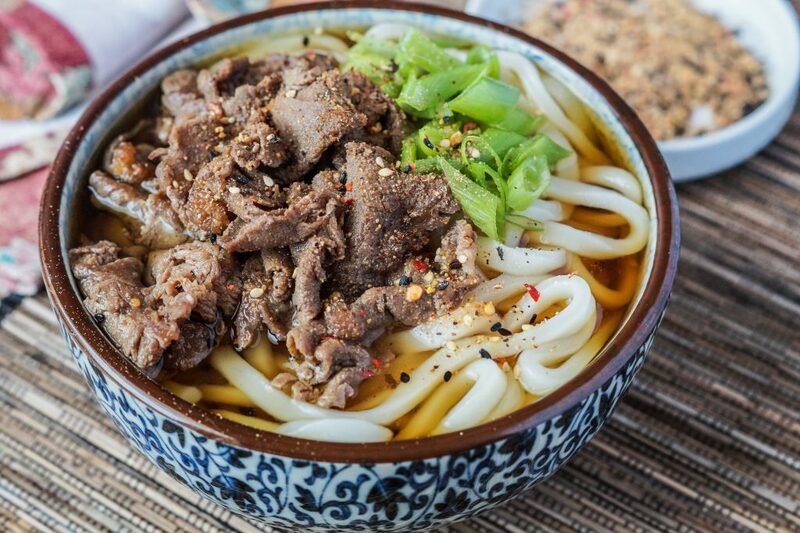 I often heat up a quarter of the soup at a time, boil one 8.8 ounce brick of frozen udon, and top it with a small amount of the marinated beef and garnishes. I topped the Niku Udon with a sprinkling of Shichimi Togarashi for an extra layer of flavor. Shichimi Togarashi is a Japanese seven-spice chili seasoning blend. The exact spices may vary based on the brand and the version I used includes a combination of black peppercorns, red chile flakes, garlic, freshly ground ginger root, nori, toasted white and black sesame seeds, and orange zest. A large pinch over your soup adds a complex hint of spice without becoming overwhelming. A few of the items used to make Niku Udon may require a trip to a market featuring Japanese ingredients. Udon are long, thick noodles with a smooth and chewy texture. I use the frozen noodles found in the freezer section of Asian markets with Japanese items and some larger supermarkets like Wegmans. The frozen noodles cook quickly in boiling water. Drain the noodles and place them into individual serving bowl immediately when the are heated through. Do not rinse. You don’t want to overcook them, since they will be hanging out in a hot broth. You can also use dried Sanuki Udon, but I just personally prefer the frozen noodles. I want to eventually try to make them from scratch at home. 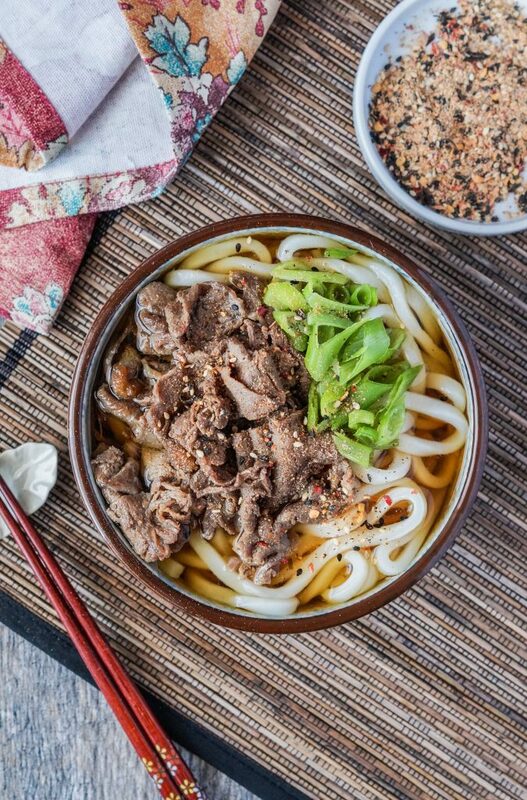 Beef is the most common meat used for Niku Udon, but you can also substitute with pork (especially pork belly) or chicken. The beef should be sliced as thinly as possible. Placing it in the freezer for a few minutes before cutting can help. I usually find beef at the local Asian food market where it is sliced paper thin. I also came across a few recipes that include a few slices of onion to caramelize along with the beef. The soup used in Niku Udon is a dashi broth seasoned with mirin and soy sauce to create Udon Tsuyu. Dashi is a stock used in Japanese cooking. It is made from Kombu (dried Japanese kelp) and Katsuobushi (bonito flakes). I have seen these ingredients at Whole Foods and Asian food markets. Mirin is a sweet Japanese cooking rice wine. I use hon-mirin (true mirin) in recipes calling for mirin. I have been able to find it in Asian food markets and Whole Foods. Many grocery stores have aji-mirin, but those usually have a lot of additives. Other types of mirin are shio-mirin (includes salt) and shin-mirin (very little alcohol). It is also available on Amazon: Eden Foods Mirin Rice Cooking Wine. Usukuchi soy sauce is a light and pale mild Japanese soy sauce used to season soups. It is sometimes labelled as light soy sauce. Do not confuse it with “lite” soy sauce in supermarkets. Those are just lighter in sodium. Usukuchi soy sauce is actually higher in sodium than the more common soy sauce. It is available at many Asian food markets. The only one available on Amazon is from Kikkoman and has high fructose corn syrup. If you cannot find it, use regular soy sauce in a pinch; just add about half the amount and season with salt. I used scallions to garnish the Niku Udon, but try to use negi if you can find it. They look like a cross between a leek and scallion and are available in some Asian food markets, though I have yet to personally come across it (hopefully next year when I move to Los Angeles!). Other popular garnishes for the soup include Narutomaki (fish cakes) and Mitsuba (Japanese parsley). Looking for more Japanese soup ideas? Try Gyoza Nabe (Japanese Dumpling Hot Pot), Ozōni (Japanese Rice Cake New Year Soup), and Toshikoshi Soba (Japanese New Year Soba). In a large pot, combine 8 cups water and kombu. Allow to sit for 30 minutes. After 30 minutes, bring to a boil over medium heat. Remove the kombu pieces and add remaining 2 tablespoons cold water. Stir in the bonito flakes until just combined. Once boiling, reduce to low heat and simmer for 5 minutes. Skim off any foam that develops on the surface. Remove from heat and allow to sit for 15 minutes. Pour through a fine mesh strainer or cheesecloth into a large bowl. Don’t squeeze excess liquid from bonito and discard. In a medium bowl, whisk together sake, sugar, 1/4 cup soy sauce, and grated ginger. Add the shaved beef pieces, tossing to coat well. Allow to marinade for 10 minutes. Place a large skillet over medium high heat. Do not add oil. Once heated, add the beef with marinate, spreading out to cover the entire base of pan. Cook, stirring often, until most of marinade has evaporated and meat is browned, about 5 minutes. Return strained dashi (water cooked with kombu and bonito) to cleaned large pot over high heat. Stir in the mirin, 1/2 cup usukuchi soy sauce, and salt. Once boiling, reduce heat to low until ready to serve. In another large pot, bring water to a boil over high heat. Add frozen udon and cook until just tender. Drain and divide the udon among 4 large soup bowls. Pour the hot broth over the noodles and top each bowl with cooked meat. Top with sliced scallion and shichimi togarashi. Mmm this looks soo filling and yummy!!! Love Japanese food and this sounds delicious! What a fantastic dish! Looks so comforting especially on a cold night. I’m a big fan of Japanese food – this looks so filling and delicious! I want to say something thoughtful, but all I can think about is sticking my face in that bowl. It looks SO good! This looks like an awesome recipe for “niku udon”. It looks like it is pretty easy to prepare too.